There are three airports near William & Mary. Newport News / Williamsburg International Airport (PHF) is the closest, about a 30 minute drive away. 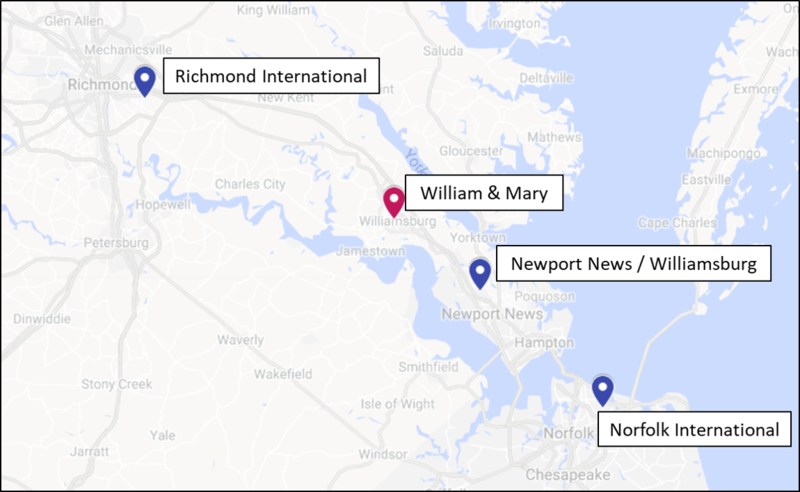 Richmond International Airport (RIC) and Norfolk International Airport (ORF) are both approximately a one hour drive away from William & Mary. Tidewater Coach Shuttle services all three airports. James River Transportation services RIC and ORF. There are other shuttle options on the William & Mary website. There will also be a travel forum opened prior to the workshop so you can coordinate transportation with other participants. Parking passes can be requested during registration. Dorm information will be updated soon. There are several hotels in the vicinity of William & Mary. If you are staying in a hotel, you will need to book your own reservation. We suggest booking early, as Colonial Willamsburg is a popular summer destination. William & Mary has a list of nearby hotels on their website. Click the image below to download a pdf of William & Mary's campus. An annotated map will be added soon. More information about Williamsburg can be found on this page.